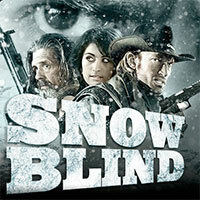 SNOWBLIND is true film making 2.0: Community-powered, fan-based, graphic-novel grindhousy goodness… Shot on their own money and post-produced in endless hours of unpaid work. What else to do but share it with the world for free now – because in our present, yesterday meets tomorrow and spaghetti western goes digital! Notorious gunman Clayton Young is given a last minute pardon from death row, only to be sent on an assassination mission for the ruthless Governor Lafort. The target: Matthew Saberneck, a living legend of a mercenary. Saberneck didn’t only disobey the gruelling orders of his former employer — he also freed one of his female slaves and married her. Now Clayton is supposed to make friends with that ageing gunslinger, in order to intrude his fortified ranch and strike when the opportunity arises. But the Governor’s scheme didn’t take into account the code of honour of those gunfighters — even less, it accounted for the ravishing attractivity of Naina, the newlywed Mrs. Saberneck. So in a flash, a love triangle is created — of the sort that concentrates on the exchange of bullets instead of niceties. Snowblind was created by Mangofilm, a posse of German movie enthusiasts who were united by their strong love for 70s and 80s grindhouse cinema. With the daring concept of “cowboys with motorbikes” we were able to draw a lot of professionals to both sides of the camera. A cast of fresh talents from the US, the UK, Australia, Ireland and even South Africa make the film truly international. Snowblind was produced entirely on private money, and used the help of the online community “wreckamovie.com“, which was funded by the makers of internet phenomenon “Star Wreck”. After 18 months of hard work, Snowblind had it’s world premiere on the 20st Emden International Film Festival on the 7th of June 2010. Since then, the film has toured several countries, winning “Best International Picture” at Belfast’s Yellow Fever International Film Festival. SNOWBLIND was shot entirely against green acreen — using the so-called “backlot” technique. Only through that method was is possible to bring our story’s epic landscapes needs to the big screen on a low budget. In the impressive visualisation, realistic environmental factors such as snow, ice and fog clash with stylising elements like backlit silhouettes, slow motion effects and graphical elements straight from the pages of manga books. Maintaining typical features of the western genre at the same time creates a unique kind of visual irony, thus compensating the budgetary constraints with a lot of freshness and charme. Since Mangofilms has put every last cent of its private money into Snowblind, they need your help raising the funds to shoot their next feature film. You don’t need millions of dollars or Euros to make a great movie (but it sure helps), best wishes for your next project. You don't need millions of dollars or Euros to make a great movie (but it sure helps), best wishes for your next project.